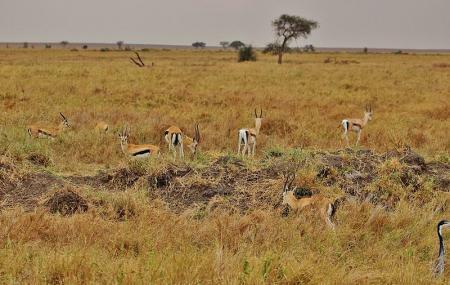 Serengeti National Park is a nature preserve which provides food and shelter to a number of animals. Before starting the safari the staffs of the preserve provide you with detailed information about the spot. It provides you with cars for your journey. The foods and drinks are also provided by the preserve so that you can fill your tummies. It will provide you with some necessary equipment and a guide to accompany with your journey to ensure your safety. It houses several rooms which gives you the opportunity to accommodate here. Different types of animals like lions, cheetahs, leopards, elephants, giraffes and monkeys can be found in the Serengeti National Park. Amazing park... a dream made true by true locals.... great safari vehicle.... great guide. Contact Bantu Pori Journeys , they are a local company located Kilimanjaro town, with great services. you wont be disappointed. It was my dream holiday. This is a wonderful experience. These are animals simply beautiful. They are lives in peace and harmony... Amazing..
Serengeti National Park is an amazing experience. We were lucky enough to see all of the Big Five in one day. Both our guide and our driver were very knowledgeable. Everyone was so friendly. Serengeti is very special. It happens that a lion kill is reported through radio, you take a bumpy ride 2 hours and on arrival the show is over! The park is huge, chance plays big role what you are going to see. Take the book Safari Companion by Richard Estes with you for deeper understanding. Serengeti national park was fantastic today March 12, 2019. We saw many different types of animals. The most spectacular was to witness 4 female lions bringing down a huge zebra in a spectacular team hunt. Later, we saw two pairs of cheetah on their Serengeti style honeymoon.